The Formula One Racing Team Name Force India will no longer be in use for 2019! Recently, the British-Based Formula One Racing Team Racing Point has announced that Racing Point Force India, will no longer be in use, instead taking on a shorter name Racing Point F1 after a list published by the FIA last Friday. Previously the team was called Sahara Force India, who was led by businessman Vijay Mallya & Dutch Businessman Michel Mol who had purchased the Spyker F1 Team for €90 Million. Then in October 11, an Indian company named Sahara India Power, had purchased 42.5% of Force India's Formula 1 Shares, which was around US$100 Million. Though recently in July of 2018 the team had stated that they had been put into Administration by the High Court in London. When it was announced that the team was going into Administration, it was suspected that British Energy Drink 'Rich Energy' was going to purchase the team, though it was then later announced that Racing Point UK, who is lead by Lawrence Stroll, the father of Lance Stroll who raced for Williams in 2018. As of right now the team has announced their 2019 Driver Lineup, which consists of the Mexican Sergio Perez & Canadian Lance Stroll. It has also been announced that Ferrari has an official name change to Scuderia Ferrari Mission Winnow & Hass has been announced to become Rich Energy Haas F1 Team, due to their sponsorship deals. Two time Formula 2 Champion George Russel has announced they will be joining Williams, and Lando Norris will be joining McLaren. Do you prefer Sahara force india or Racing point F1 Team Name? interesting although Force india wasn't as popular as Mercedes or Redbull or Ferrari it's still nice to see that Force India or better now known as Racing Point is getting some attention. To be honest, Force India became more popular when they signed the deal with BWT Water. 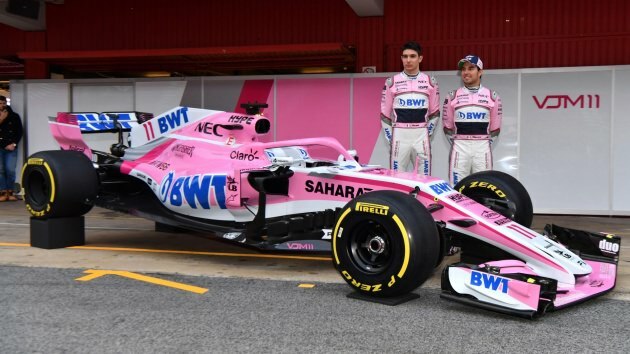 - Turning their car liveries pink instead of the previous car design was a big forward for them.